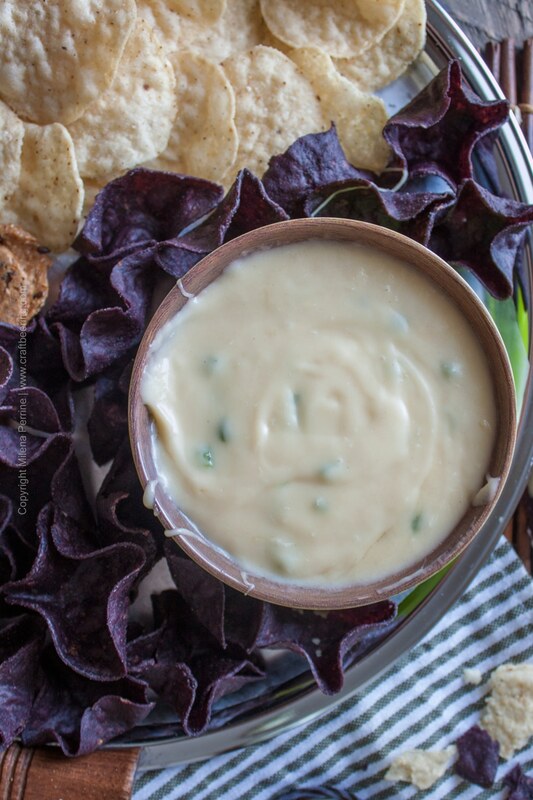 This Fontina beer cheese dip incorporates the flavors of an American blonde ale brewed with honey and fresh jalapeño. And it is simply perfect with tortilla chips and pale ale. Last week we had invited a few friends over and planned a taco bar, which of course implies tortilla chips and the necessity of an appropriate dip for them as accompanying items. We also had quite a few bottles of St.Lupulin. The last ones this year of a seasonal dry-hopped pale ale brewed by our local Odell Brewing Co. It is strikingly aromatic, not too bitter (IBU 40, as can be expected from a dry-hopped ale), beautifully crisp and easy to drink. Pale ales are Chris’ favorite style and I wanted to make a tasty but balanced dip that’d really pair well with the St. Lupulin. Perhaps a hint of spiciness in the dip, but nothing overwhelming, with neither the cheese nor the beer contributing overpowering flavors. Beer wise I settled on a blonde ale brewed with honey and cheese wise I decided on Fontina. We happened to have one last can of Killer Bees American blonde ale brewed by Melvin Brewing Co. in Wyoming. (Most recently they got a Gold medal for their pale ale Hubert at the 2017 Great American Beer Festival (American-style strong ale category). It is so different from the St. Lupulin, such a pronounced resiny bite for a pale). But back to the Killer Bees blonde ale in the Fontina beer cheese dip. It is not overly sweet despite the touch of honey. We thought the honey can mostly be discerned in the aroma, accompanied by very pleasant floral hop notes and mild biscuity and grassy flavors. Perfect match for Fontina. I could have easily used an amber ale or a Munich Helles or just a classic blonde ale instead and achieved very similar results. The options in terms of beer style are noted in the recipe. Cooking with beer always entails more than one beer style options. That’s something to love, isn’t it? Fontina is a semi-soft Italian cow’s milk cheese known for its earthy flavor and excellent melting properties. The original Italian cheese acquires a nutty taste when aged and is covered with a muted orange color rind. It can be quite pungent. The cheese I actually used for this Fontina beer cheese dip was a milder version of the style, produced in Wisconsin. In result it had very subdued flavors overall and married well with the honey blonde ale and the fresh jalapeño. I cleaned the ribs and removed all the seeds of the pepper prior to dicing it to ensure the residual heat will be mild and complement the subtle flavors of the other ingredients. 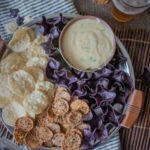 TIP: Reference our post on Red ale and Gouda dip for general tips on how to approach hot beer cheese dips, appropriate cheeses to use as well as pointers on beer styles. Otherwise, the preparation technique is as simple as can be (basically a lot of stirring and circular motions. It is the same regardless of whether you intend to call the end result a Fontina beer cheese dip or fondue or simply a beer cheese sauce. Enjoy! Fontina cheese (a true hero when it comes to melting powers) and sweet blonde ale with mild heat from fresh jalapeño. Really good with tortilla chips, crackers, bread. Shred the Fontina, coat with the 1/4 cup flour and set aside to reach room temperature. Once the cheese is at room temperature over medium heat melt the butter and add the diced jalapeño pepper. Stir a few times. Add the additional 2 tbsp flour and stir to form a roux. Slowly add and stir in the blonde ale. Remove from heat and begin adding the flour coated shredded Fontina cup by cup, slowly stirring it in as it melts. Season with salt and white pepper and transfer to a serving dish or a fondue pot to keep it warm. 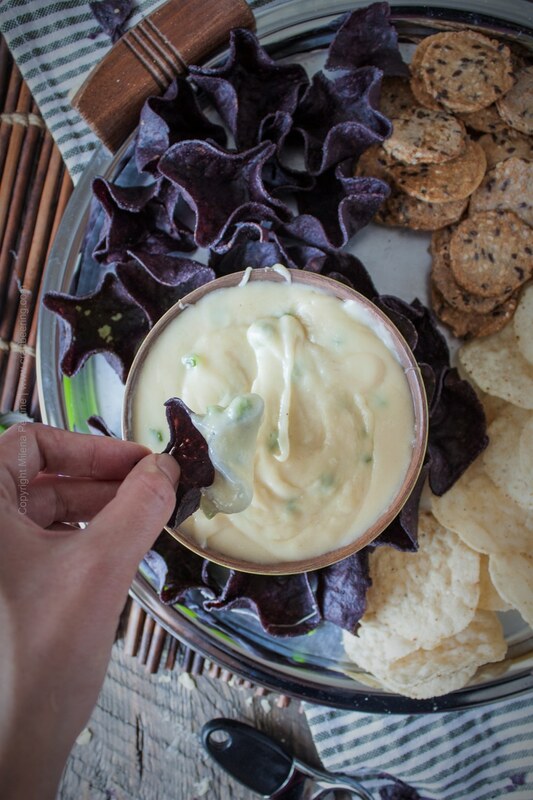 OMG…I have always wanted to make beer cheese dip and this sounds amazing! I just bought a bag of fresh tortilla chips from this grocery tore and also another bag of Trader Joe’s Organic Corn Tortilla chips so I cannot wait to make this stuff! Will have to let you know how it turns out! We left the seeds of the jalapneo and it was quite spicy, which is what we were after! Great, easy recipe. I was going to comment that this dip seems very mild until I read about adding Jalapenos, that will give it the zing. Chips and dip are one of the most loved treats to serve a crowd of people, everyone seems to love it. This dip looks like it would be a huge hit. I can never pass up salsas and dips and this one sounds delicious! Perfect for fall weekend football games! Thanks for sharing!! My husband is obsessed with cheese, he would love this recipe. I think I’m gonna make it over Christmas! I ALWAYS crave tortilla chips, especially if it paired with a cheesy dip…..actually, I probably crave it a little too much, lol. Love that you used fontina cheese here and especially love the spice from the pepper. I would have a hard time sharing….hehehe. This is what I call weekend eats! Thank you Dawn! I am like that with potato chips. Potatoes in general I guess, lol. But these white tortilla chips in the pics here have bewitched me! They are from a local grocery chain, their own brand and are strikingly good. Have already purchased them twice since this post! This is a very special dip that we will love! Thanks so much for sharing with us at Full Plate Thursday. Have a great week and come back to see us real soon! I love beer cheese and fontina is one of my favorite kinds of cheese! It’s so melty and delicious. 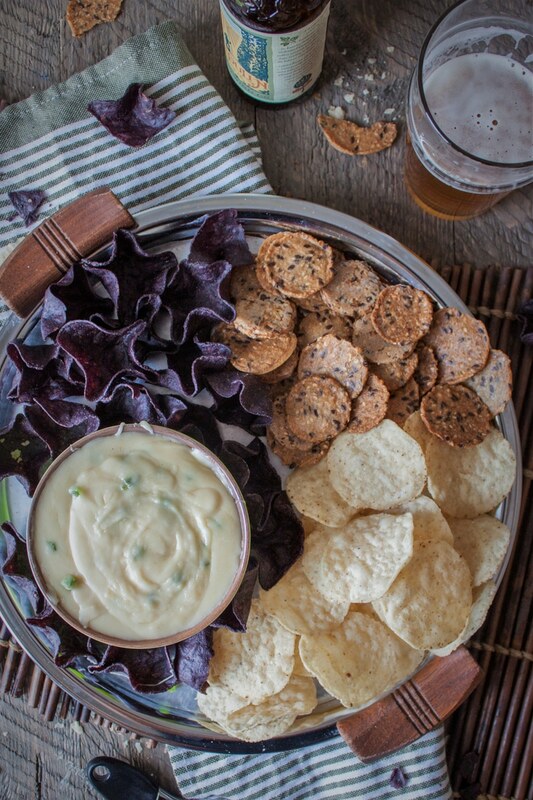 This fontina beer cheese sounds like the perfect way to satisfy that chip craving! Totally! Beats salsa:) Thank you Rachelle! Mmmm…that melty cheese! And thanks for linking up at Friday Frenzy Link Party! I hope you link up again next week 🙂 PINNED! Yes! Gotta love this one:) No single flavor overpowers the rest and the texture from Fontina cannot be beat! Thank you so much Annie! Have I told you before just how much I love beer cheese dip? In case I haven’t, it’s A LOT. I’m adding the ingredients to my shopping list so I can munch on some of this while I watch football this weekend :). Thank you for the inspiration! Thank you so much Jennifer, we agree, Fontina is an amazing cheese!